Researchers from Rice University developed a new strong fiber material made from large graphene oxide flakes. What is unique about this new material is that when you tie a knot with it, the know it just as strong as the fiber. 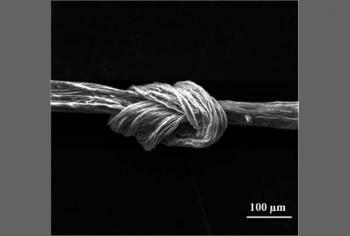 Usually fibers are weaker at the knot, but this new material has "100% knot efficiency". This is the first time such a property in carbon or polymer fibers have been reported. The graphene oxide flakes were produced at Rice using a patented process they developed a few years ago, by chemically extracting them from graphite. The flakes have an average diameter of 22 microns. They explain that because of graphene oxide very low bending modulus, it's as if there's no knot at all. The researchers say that this material can be used to increase the strength of carbon-fiber based products.